Offering unique designs to a variety of apparels, we are well reckoned amongst our national as well as global clients. Our exclusive designs are very popular across the globe. We are one of the leading manufacturer and supplier of Embroidered Fabrics which are higly appreciated and valued by our customers for its trendy designs, high durability and excellent finishing. These range of products can be customized as per your valued requirements and specifications on any type of fabrics and patterns provided. 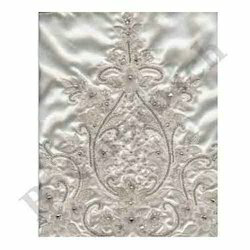 We offer Embroidered Bridal Fabrics to our valuable clients which are fabricated from high quality of raw - materials. These range of fabrics are exclusively embroidered by us at a competitive price and can be further customized as per our customer's requirements. 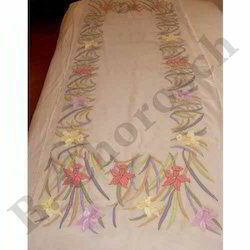 We provide embroidered belts in different shades and sizes. 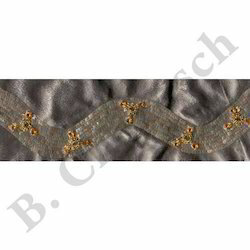 Both hand and machine embroidery is used for embellishing these belts. 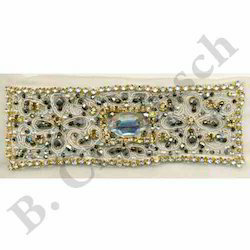 We also use colorful beads and stones for providing these belts a distinct look and also to add more style. Having popularity in the international market , these belts are available at most competitive prices. 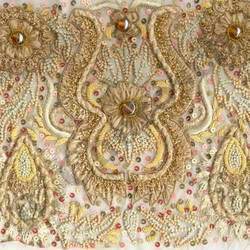 We offer our esteemed clients with Embroidered Beaded fabrics or exclusive beading done on our clients fabrics as per their designs if required. This beading can be used for gowns, dresses, sarees, accessories, fashion apparels or various different apparels. Moreover this beading is in demand for its stunning and exclusive designs and is manufactured from indigneious or imported raw materials thus meeting the varied needs of all. Straw work, Rafia work may be used on its own or added onto the embroidery. Straw/Rafia available with us could be local or imported, as per the choice of our buyers. Straw work could be done for Dresses, Bags, Shoe uppers and also Belts. Straw work again could be dyed in various radiant vibrant shades to maximise the richness of the embroidery and beading. We make a wide range of Embroidered Ladies Purses which are made from superior quality of fabrics, leathers and suedes. These ladies purses, bags, clutches are easy to carry and are trendy in designs. 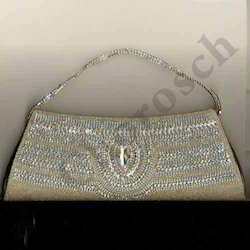 Our elegant collection of ladies purses is designed in a manner to enhance the personality and is suitable for evenings parties and cocktails.Clients can avail these high quality products at reasonable prices. 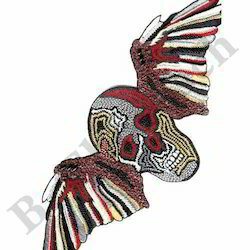 Our range of high fashion and trendy Embroidered Necklaces, Earrings, Cuffs, Bracelets, are fabricated from a high grade of raw materials imported as well as indigenous. 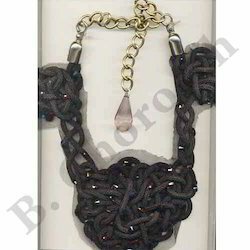 These Necklaces, Earrings, Cuffs, Bracelets, are designed by our expert designers and can be availabe in bulk at a very cost - effective price. Some of the special features of our products are smooth edges, great finishing with trendy designs and patterns which are regarded high in fashion appeal. 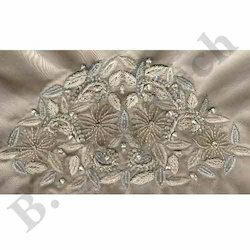 Appliques Embroidery Work offered by us are demanded by our clients for their unique designs and antique looks.These range of work is designed by our designers and is highly appreciated all over the world. These products can be customized as per our client's requirements and specifications at a reasonable price. These appliques when put on any evening dress further enhances the beauty and the appearance of the wearer. 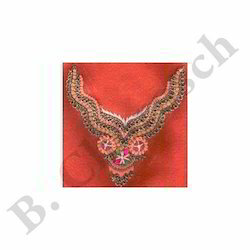 Embroidered Crystal Work is highly appreciated if used imaginatevly, be it on Dresses, Belt, Bags, Evening-wear, Gowns, which highiy enhances the look and the feel of the end product. 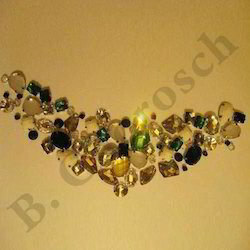 This crystal work is liked for its unique designs and also fabricated and embellished from high quality of stones, Swarovski, crystals etc. Our range of works are done by using different colors, shapes and various brands of crystals. Embroidered Cut Work is highly skilled work requiring precision and accuracy which we offer by using on various fabrics, subsequently beading and embroidering around to give a classy overall effect to our exclusive designed product wearable for all occassions. 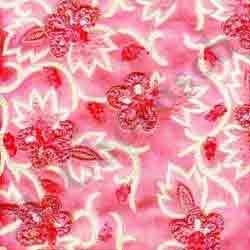 This cut - work can also be used for borders, collars and dresses. The ultimate in embroideries which is zardosi work can be availed from our experienced persons in our factories working for generations. This is a very fine intricate embroideries produced in our workshops for decades and could well claim to be the pioneers as well as our forte. 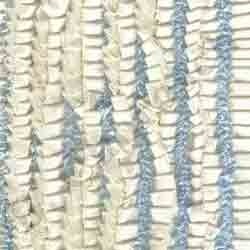 We do this artistic work on fine french chiffons to wools, felts and leathers as the need arises. Some of the Zardosi work may be heirlooms and worth collecting for their never fading styles. We do lots of Ribbon work in various sizes, quality and widths of ribbons in addition to the beading and embroideries on Nets, Satins, Tulles and different types of fabrics with embellishments. This creative Ribbon work distinguishes the style from the regular qualities available making the person dorning it extremely classy and exclusive. Thread work at our workshops is done in a very precise and technical way. This is a very fine art which when done on any fabric looks like a painting. Thread work is done in various different techniques by us as the need be. 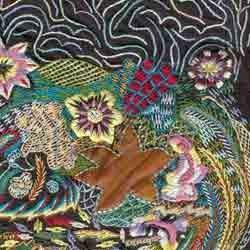 Threads could be of silk, wool, synthetics or any such kinds to stitch in a very stylish and artistic manner. 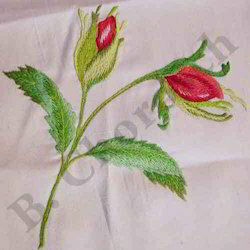 Embroidered Chennile Work offerd by us are available in various colors and design meeting the demand of international clients.These range of products are made from high grade materials and also available with us at a very cost-effective price. We offer a variety of embroidered badges. 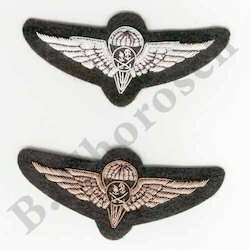 These embroidered badges are used by military, sports, clubs, film industries, personal and various other usages. These are also used by various organizations for different types of uniforms. We have gained impeccable expertise in designing Embroidered Badges. Our range of badges includes Embroidered Logo Badges, Designer Embroidered Badges, Embroidered Motif Badges, Brand Embroidered Badge and various other types . We also help to create , design and make as per the clients needs and requirements. 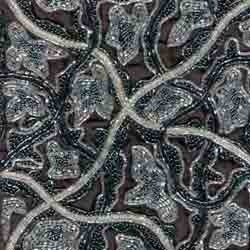 Creative sequens work done thoughtfully makes the fabric look rich and gorgeous. Sequins can be artistically added to printed fabrics or give 3D floral effects to plain fabrics with different shades and size of sequins. 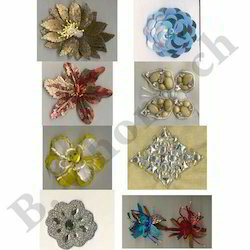 Sequins are available in different qualities like iresdecent, pearl finish, metallic etc. as the style requires. Embroidery/Beading done of pearls to suit the latest trends. Pearls are available in different colours and shapes to blend with the embroidery and to amplify the artistic work be it machine embroidery or hand embroidery. Many accessories are made just from Pearls like necklaces, belts etc. to match the embroidered dress/gowns to make it more rich and aristocratic. Moreover this pearlwork can be dorned by itself as a piece of jewelery. Creatively embroidered ready laces or embroidered tulle or Chantilly lace pronounces the excellent lace distinctly making the otherwise sundry lace more richer and extremely exclusive. These laces could be used on Sarees, Dresses/Gowns imginatively just creating a separate outstanding product by itself. This is where our creative talents play a vital role. 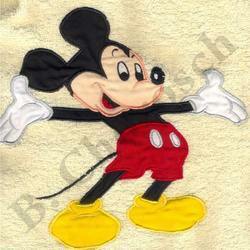 We offerFancy Embroidered Thread Work to our valuable clients which are fabricated from high quality of raw - materials. 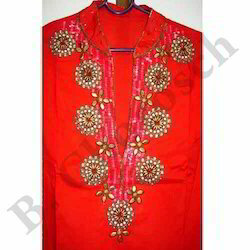 Our client's can avail premium quality of Embroidered Dresses which are known for its long lasting and reliability. Moreoever these range of products are made from quality approved fabrics and raw - materials and are also appreciated by our clients for its quality and apprehensive features. These range of products are available at reasonable prices in bulk. 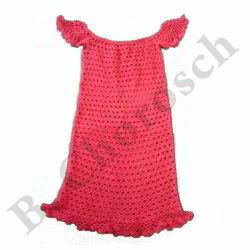 Our motifs are available in a wide range of size, colours, patterns, designs and shapes as desired by our clients. 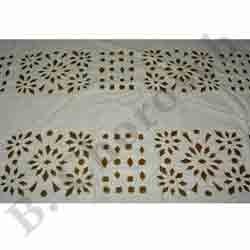 These motifs are fabricated from quality approved raw - materials. 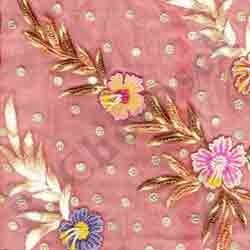 These motifs are blended to give an exclusive rich feel look of the dress/finished product. 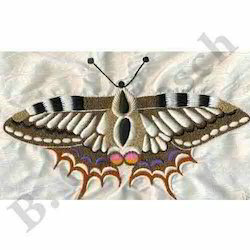 Buyers who are cost conscious can avail our facilities of combining our hand embroidery alongwith machine work in wholesale. 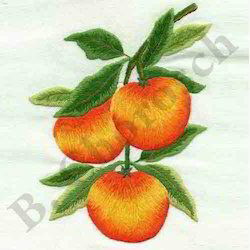 Embroidered patch work as the name suggests could be patches on various garments to pronounce the style quotient. These patches are made with excellent 3D effect for awesome effect. Patches could be may be produced by only thread or a combination of sequins , beads or bullion embilished by crystals as the requirement of the client. 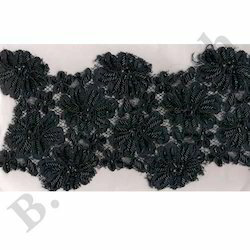 Our company is counted among the leading manufacturers and exporters of Embroidered Crochet Work which are available in soft colors and color combinations, which are soothing in texture and feel. We use premium quality threads and other material from reliable vendors due to which our designs never fade. The crochet work done by us on various apparels as won lots of applauds. We offer to our customers, a range of latest Embroidered Shoe Uppers that is available in various specifications, patterns, sizes, styles and can also be customized as desired by the clients. Further, these are widely appreciated by our clients for its quality and apprehensive features made on fused fabrics, suedes, leathers, mesh etc. Furthermore, we offer these products to leading international producers industries at competitive prices. 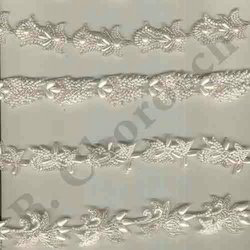 We are one of the leading manufacturer and supplier of Embroidered Cord Work which are designed by our expert designers and fabricated from a high quality of raw - materials. These range of cord work are demanded all over the globe for its perfect finish and well knitted design and classy looks. Moreover these products are available at a very cost-effective price. 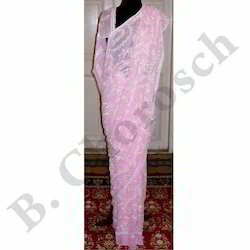 We B. Chorosch are one of the poineers and leading manufacturer and supplier of Embroidered Sarees which are highly appreciated by our customers. These range of products are made from quality approved raw -materials and also known for its special features like high fashionable appeal and made from finest threads used in crafting these sarees. These helps us to ensure flawless finishing and are marketed at affordable prices and is a collectors item well compared to apiere of jewelery.